Two vacation-planning websites that answer questions – on line — as fast as you can ask them help take the guesswork out of where to go and what to do. SONOMA, CA — Two vacation-planning websites www.top50ranches.com and www.ranchweb.com answer questions on line about dude ranch vacations as fast as you can ask them and take the guesswork out of where to go and what to do. 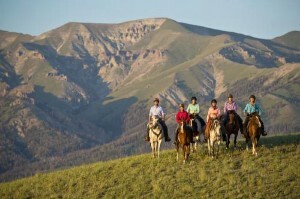 The dude ranch vacations is truly one of America’s most iconic homegrown experiences. Born in the late 1800’s shortly after the Battle of the Little Big Horn, dude ranches gained widespread popularity in the 1920’s with the establishment of the National Dude Ranchers’ Association in 1926. Today they are more popular than ever offering, among many other positives, a haven from urban, industrial and technical worlds; down-home cooking with a gotta-be-fresh flair; the joy of bonding with a mount suited to a guest’s temperament and riding ability; and always the beauty of the natural world. “Ranch life remains one of the last authentic traditions in a landscape of technology where everything is instantaneous and ‘virtual’ in reality. A dude ranch vacation is a down to earth thing that helps us all reconnect with the natural rhythm of the earth,” explains Gene Kilgore, the world’s leading authority on ranch vacations. Kilgore brings over three decades of passion for ranch vacations via his advisory involvement in and endorsement of these two web sites. He has visited and personally vetted most all of the properties represented, while also serving as goodwill ambassador to the ranches, bringing his knowledge of the needs of ever-more-discerning travelers to the ranchers and advising on how a business might tweak their accommodations, food, overall hospitality and activity offerings. He also helps guide businesses into the realm of hosting corporate and other groups, and whether or not their facilities and activities lend to being family-friendly. Founded in 2011, www.top50ranches.com focuses on where to locate and then what to expect when it comes to the world’s top dude, guest, working and luxury ranch vacations in the United States and Canada as well as Argentina, Mexico and New Zealand. Here in the US guests may opt to horseback ride through the stunning Tetons and relish after-ride massages; or in Colorado they can mix up horses with fly fishing for trout, trap shoot, swim and send the kiddies to a children’s program. They can assist with cattle drives and branding activities; and they can opt to just be pampered in world-class scenery. Some operations are large, offering accommodation and activities for up to 225 guests; others are small, providing hospitality to just six guests at a time. The website explains when the ranches are hosting guests, miles to the nearest airport, and the style of pampering or not that people can expect. The site outlines special ranch offers, events and opportunities as well. For example Wyoming’s Bitterroot Ranch features a world-class riding program geared to advanced and intermediate riders exclusively and Colorado’s High Lonesome Ranch caters to an older crowd offering adult-only weeks during the summer. South of the border, Rancho Los Baños offers a Mexican Corrida in November so that guests can experience a genuine Mexican roundup with vaqueros (cowboys), horses, cattle, lots of drives and cattle work. This all takes place on 30,000 acres in the foothills of the Sierra Madres, the Mexican Rockies, in Sonora, Mexico, just 55 miles south of the southeast Arizona town of Douglas. This site also makes available Top50’s Concierge Service, a no-fee advice option on line or by phone for valued Top50 Travelers who seek a little extra help while choosing the right ranch for their party. www.ranchweb.com which was founded in 1995 and regularly updated, offers an array of dude ranches in the US, Argentina, Brazil, Mexico and Canada. Arranged alphabetically by destination, these ranches also organize themselves along the lines of the number of guests accommodated at one time, the activities, and if they are family friendly. A multitude of activities range from horseback riding and instruction (novice to advanced,) fishing (expert fly fishing guides on site), hiking, swimming, archery, shooting, rodeos, games, cattle drives, mountain biking … and the list goes on. Several dude ranches offer specialty themes, such as photography, art, birding, cooking, wine tasting, and father-son and mother-daughter bonding adventures. Potential guests of businesses listed on this site may also contact a Ranchweb Concierge Service for additional assistance in sorting through the myriad of options including always-changing travel options now being listed into 2017.